In 1961, the year after he arrived in America, Katayama estimated that it would take until 1970 to get the right car for the American market, one with at least a 1600cc engine, real performance, and some style. He was off by a few years. The first really viable Datsun was the 1968. What saved the company in the meantime, though Tokyo was loath to admit it, was Nissan’s little pickup truck. It was small, it was inexpensive, and it exploited the single Japanese automotive strength – durability. Even more significant was the fact that, as Katayama soon learned, in western America and especially in California the pickup had a function different from the one it had elsewhere. Here it was both truck and passenger vehicle. Many Americans worked their small patches of farmland for an hour or two in the morning before driving off to a factory job. Some who no longer worked on the farm kept a pickup nonetheless, as if to sustain their sense of self. Other, older Americans preferred pickups because they held up well; younger ones liked them because of the image of ruggedness they projected. People who owned small companies, maybe just one or two employees or maybe just themselves, needed a pickup for work and liked the Datsuns because they were cheap and tough. The pickups sold right from the start. They sold without advertising. They sold because the men and women who came in to look at them could sense that they were well made. They sold because the word of mouth was phenomenal. These funny little trucks, owners told their friends, lasted forever, and nothing ever went wrong – they were a real buy. The sales were so good that Nissan’s West Coast office soon had twice the total volume of the East Coast’s. ln 1963, for example, a critical year when Datsun was just beginning to get a foothold in the American market (late that year it moved into the top ten importers in terms of monthly sales), the western division outsold the eastern 2,781 vehicles to 1,151. Of the western division’s sales, 1,597 came from small trucks. Tokyo was ambivalent about this desperately needed success. Nissan had wanted to arrive in America and be classy and sell cars and make a reputation; it had not wanted to come and sell trucks. So when Katayama kept talking about the need to improve the trucks, management refused to listen. 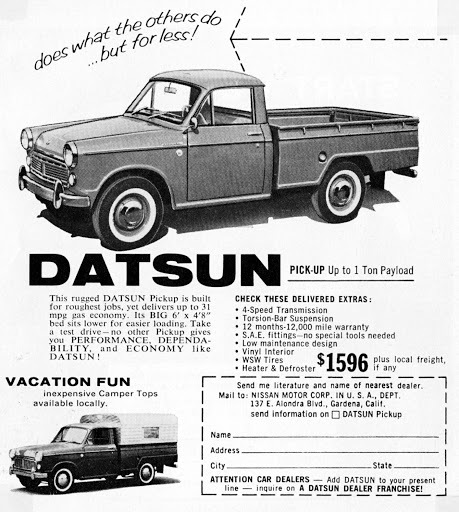 Katayama was trying to tell the home ofice that more than half of these Datsun trucks were used for commuting, that they were, in effect, being used as cars, and that the market would explode if Nissan simply upgraded them a little. But Tokyo would not budge. A truck was a truck, and Americans had no right to use one to drive to work, particularly to offices. That was wrong of them. The trucks should be used for carting heavy goods. Katayama suggested certain changes that would permit owners to convert them rather readily for family use, and again Tokyo vetoed him. Families had no business riding around in pickup trucks. Katayama sometimes wondered how many more pickups might have sold if Tokyo had listened. What also helped carry the company in those days was Takashi lshihara. Like Katayama, he was in a form of genteel exile, although he was a far more senior and powerful figure in the company, the heir apparent at one time to the president, Katsuji Kawamata himself. 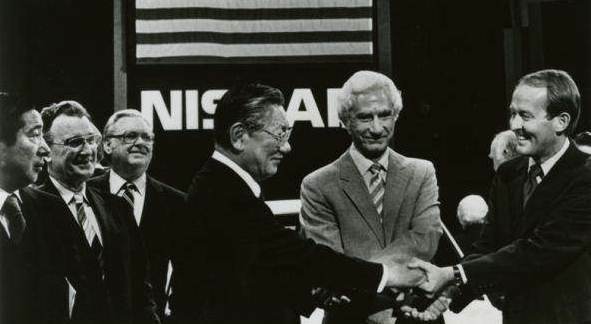 lshihara was export manager of Nissan in the fall of 1960, when he was made president of the American branch. Though for a time their purposes coincided, there was no love lost between him and Katayama. There was, after all, an ocean between them, because lshihara chose not to live in America. To Katayama he seemed just one more of that legion of insular Japanese businessmen who looked upon America simply as a place from which to take something, either knowledge or technology or perhaps some hard currency. Nonetheless, he was an extremely powerful ally for Katayama. For though they might differ on specific tactics and ambitions, and though Katayama might be more willing to adopt a truly American business style, they were as one on the central goal, which was the success of the American enterpnse. That gave Katayama a lever he otherwise sorely lacked. For Ishihara’s troubles with Kawamata notwithstanding, he was *of* the company as Katayama was not. Though his background was in finance, he was still considered more of a car man than Katayama, and his recommendations had a great deal more impact. Once, early in the course of the American venture, during a visit to California, lshihara took Katayama to dinner. The question of Tokyo’s reluctance to accept suggestions from America hung heavily in the air. It was very hard to make Tokyo respond to America’s needs, lshihara agreed. “I am the only one who can do it, who can push it through,” he said. “and l can do it only from Tokyo. Always remember that.” There was soon ample evidence of it. Nissan had capitalized the American company at $1 million. To the Japanese that seemed an enormous amount of money. There were strict governmental limits on how much a company could spend overseas, and they were sure $1 million would last five years. But America turned out to be a terribly expensive place. Breakfast at a hotel could cost the unwary traveler several dollars. Advertising on radio and television was like burning money. Even arranging dealerships turned out to cost money, for lawyers were expensive. There was no way to save. Within two years there was only $100,000 left of the original $1 million. ln late 1962, Ishihara went back to the board, hat in hand, and asked for another $500,000. There was no real challenge to him. The board voted the money rather readily, and he felt very little heat. But the American operation continued to be costly, and results remained hard to come by. A year later he had to go back and ask for another $500,000. This time he knew he was going against the wishes of the board. Some board members suggested he had been careless and that for so much money there ought to be more to show. Ishihara replied politely that he was still confident they could attain their objective, that Nissan could make a car that would do well in the American market. Indeed, he was willing to bet his career on it. If we don’t make it with this request, he added, I will resign from the company. The eyes on him at the meeting, he thought, were as cold as stone, and he could even see some pleasure in the faces of some potential adversaries. The board again gave him $500,000, but it left no doubt that he was not to come back again. It was, he often reflected later, a very close call. In 1964 the company began to show a profit, about $200,000. Years later, when Ishihara was president of Nissan and was frequently congratulated on the brilliance of its performance in America, he was always mildly amused, for he knew how near they had come to failure. Worse when Japanese like these talked about Americans among themselves, they still used the hateful Japanese word for “foreigners,” gaijin. They did not go out and get to know the market; they sat in their offices being very Japanese, trying not to make mistakes, trying not to be different. “Timid rabbits,” he thought. “I am Katayama of Nissan,” he would say when checking into a hotel or arriving at a meeting, and that was enough. He was the head of a company just as Lee Iacocca and Pete Estes were heads of companies, though of course he made about $25,000 a year, or about one-thirtieth of what they made, and soon about one-thirtieth of what some of his dealers made. This did not bother him. The other auto executives traveled with great retinues, and there was always someone to meet them at the airport, someone to get them a drink, someone to light a cigar, someone to make sure that when they went to their favorite restaurant they got their favorite table. He preferred to travel alone: he could learn more that way. He could meet people on planes and in restaurants and bars, and not be separated from them and the truth by underlings eager to protect him from the truth.